"I'm more excited than ever about the nature of my work. I feel that I'm an honest filmmaker, who, in every film I've made, even when I was compromised by finances or by producers or this or that, I always chose a subject I wanted to do and made the best of it. I find myself at this point in time, ironically enough, with the most passionate issues of my life, which have always been war and peace, survival, how to live, what a man or a woman is. How you deal with your soul. These are the big questions for me. The daily questions. I find myself in 2017, and here we are in this crazy time." Do you trust Vladimir Putin? 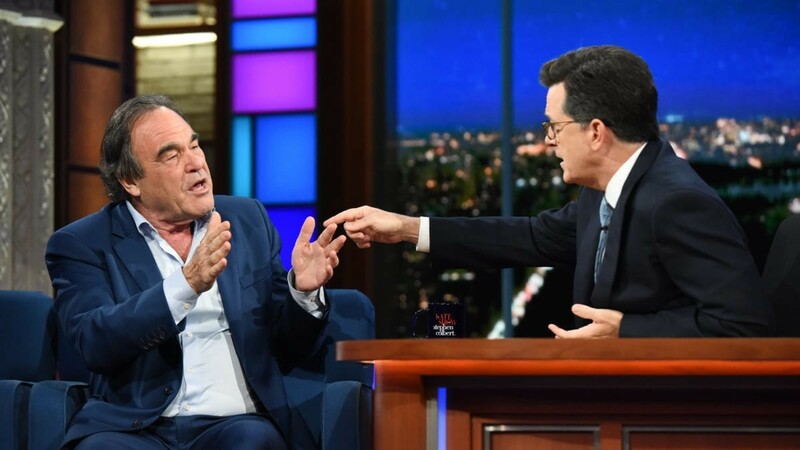 When Stephen Colbert interviewed Oliver Stone in early June this year, Stone was faced with one simple question: "Do you trust Vladimir Putin?" His answer received taunts and jeers from the audience – standard from a society he believes is trapped in a void of self-serving propaganda and communication breakdown between two of the world's biggest superpowers. But why couldn't he trust Putin? 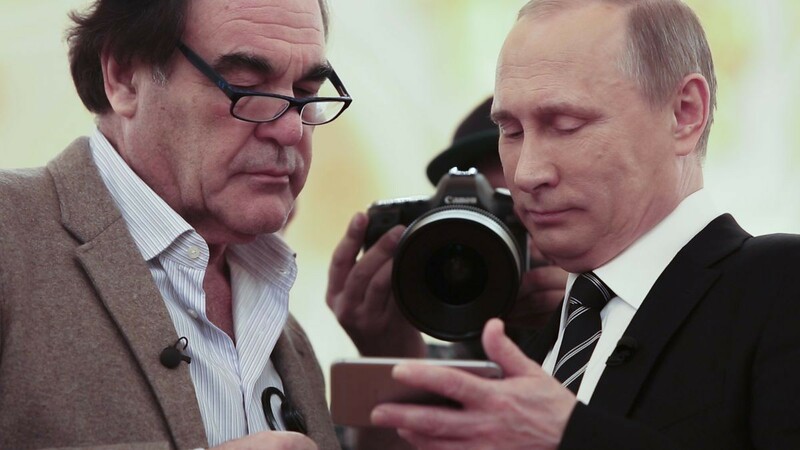 Stone recently spent over 20 hours interviewing the Russian leader on a slew of subjects for Showtime – more access than many world leaders get. As a filmmaker and dramatist first, he has chronicled humanity at its most raw and vulnerable. But from serving in the Vietnam war (twice) to spending time with the likes of Edward Snowden, his realistic depictions (as documentarian) of the horrors of American globalism has done more for global consciousness than what Colbert achieved on a soundstage that evening. Surely at this point, his instincts are able to cut through the propaganda. 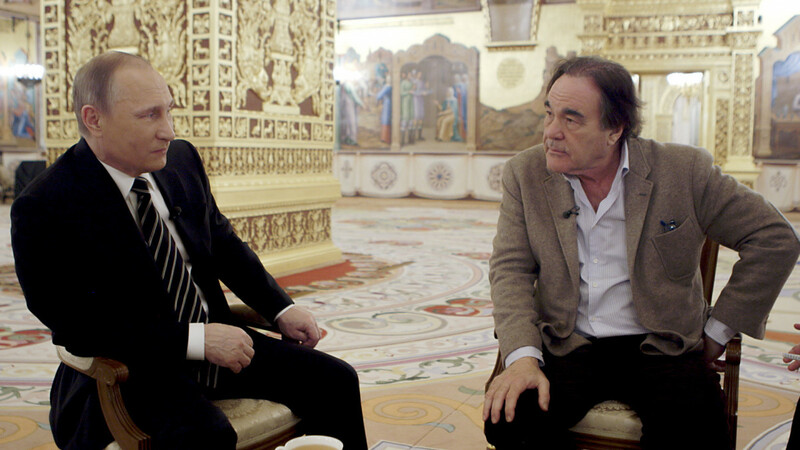 'The Putin Interviews' (available on Showtime, or for Australian audiences, SBS On Demand) is the latest in a string of politically provocative observations that lean on a critical review of successive U.S governments – one where no side is safe. For his efforts he's been called both a traitor and a peacemaker, both lauded and rejected by a media landscape fine-tuned to reject all things Russia. Thus, the question is asked whether he is trying to affect a change in his home country, or simply chronicle the demise of the world's biggest superpower: "I'm not sure it's the demise. I think the concept of chronicling, yes. But how does America last? Or will it prosper and become even more ruthless? In our history books, we teach our young people that we won World War 2 and that D-Day is a climactic battle, so just right away from the origin myth of the history of the American people and Western people, we don't have it right. Very dangerous." "I've tried to chronicle, correctly, because I learned a lot in my life. I believed all this stuff. I was an American conservative. Grew up East Coast privileged. My father was part of Wall Street, the Vietnam War service and all that, but my eyes were open by my time. How many wars do we have to live through to learn our lessons? I went to Salvador back in 1980 and I saw in Central America the same symptoms I saw in Vietnam when I was a younger man and had finally recognised what the Americans were up to. It's not easy. We can retell and tell and tell, but people will not listen. We go back to war." "The Australians should be furious about Syria, if they had any education. Your aeroplanes are in Syrian airspace now. Why? You're creating this situation for World War 3. You are very much adding fuel to the flames, so Australia is as much to do with it as America and Britain." In Russia, Stone sees not just an adversary to American exceptionalism, but a telling sign of the balance of power shifting on a global stage. It's why the U.S has begun to lash out in countries like Syria, and will continue to do so where its dominance is challenged: "I think because it is meeting resistance that it's not used to (in Russia, China, Iran, North Korea) that it's become more desperate as it sinks, as it declines. It senses its decline. We can't pinpoint it, but we sense its decline, and as a result, become more panicky, more scared, and see threats in everything. A can of soup, or a painting, or often the case, for nothing, with the fact that the Russians have supposedly 'hacked' this election (which is nonsense), has terrified the Americans into taking a very vituperative and vicious use of words to call Russia the enemy of mankind." "I'm really worried about it. We've been abusing [the Russians] for so long, since the Cold War was very much our creation to keep our military-industrial sector of our economy booming after World War 2, and we pushed it and pushed it to the point of... I mean, we had 30,000 nuclear weapons. We armed the world, we armed our allies, often not of self-interest, for money, and gave weapons to people who don't deserve them, shouldn't have them, are not responsible. Now, the world is proliferating more and more of that." Stone feeds an appetite for drama with documentary realism, and so it seems odd that he has little time for Trump. When pressed, however, it becomes clear that he sees no. 45 as little more than a reminder that true power doesn't come from democratic means: "We're useless. We don't have power." he laments. "Power is being the head of Halliburton or being a contractor in DC or having a vote, a serious vote, or being a general or this and that. The truth is, even Mr. Trump has found out that he doesn't have power. Whatever he wants to do, he knows he can't do it unless he gets the approval of the American... call it the security state, deep state, whatever terminology. I fear that Freud's 'Death Instinct' was correct. The death instinct manifested strongly in World War 1. There was no need for that war. It was an empire's frivolous war, but you see again, millions of people die in these things. Millions and millions. It's the most dangerous exhibition of the death instinct that we have. The 20th century was a lesson and here we are in the 21st repeating the same symptoms." So what's the solution? For a start, more documentation, and more truth. Stone sees the Snowdens and Assanges of the world as forebearers of the truth; those who are doing more to liberate the world from trigger-happy governments than anyone else: "Julian Assange should be a hero. I wish he could be elected to office. I would put my faith in him. He's a difficult man, cranky. He's not a likeable man, but again, it's not about ego. That's the problem. We elect ego in the United States. It's not to be popular, it's to be right, and unfortunately, they have isolated him and now they're going to arrest him. I hope to God he makes it out of there." "All these whistle blowers [Assange, Snowden, Manning] did a great thing. All of them, and I wish more of them existed. The problem is that not enough of them are coming out. They should really blow the whistle on the Pentagon: They have so much overuse of over budget. It's beyond belief that there's nobody to correct them anymore. " Documentation is the other necessity to open people's eyes through storytelling and reality. "My [film] The Untold History of the United States was an honest attempt in 12 hours to get to the bottom of these myths that have grown up in my country. It took me five years to make that, and I had history professors (like Peter Kuznick) working with me. This was a serious effort to attack the myths that have grown up with America, starting with World War 2, they accelerated after that into the national security state, but we actually started the myth of communism, the myth of the worker state, and capitalism's self-preservative fear of worker revolt. Any worker revolt. The worker has been defeated." In an interview Semi Permanent held with noted sculpturist Tom Sachs, he says that "all art in the name of politics is propaganda". Stone's work is about breaking the cycle between propaganda and the truth; a lifelong journey to dive deep into a global psyche to uncover what will tear us apart (or bring us together). And thus, Stone's goal is two-fold: One to document the reality of living in a volatile millennium that is equally advanced by technology and set back by conflict, and two, to inspire people to live better and create the future they want to live in. "This is all my battle, too. It's taking me a long time to get to this place where I see these things because we have so much distraction in our lives. I hope my life doesn't coincide with the end of the world. A lot of people have that ego trip where they think because they die, the world is dying, and I see that, too, but I hope that doesn't happen and I hope this new generation, my kids included, can have a wonderful prosperous life, which is what it should be and a good use of our resources. Save the planet and that's me. That's basically my films. There you go."